The collusion add-on for Firefox is super-legit. Just navigate to any website normally, then just click the little collusion icon in the status bar and a full detailed report pops up in a new tab describing all the sites that the current site shared your data with (shared as in connected). View the full introduction to Collusion on mozilla.org or the Add-on Page. Collusion (by Jono X, Dethe Elza) is an experimental add-on for Firefox that allows you to see which sites are using third-party cookies to track your movements across the Web. 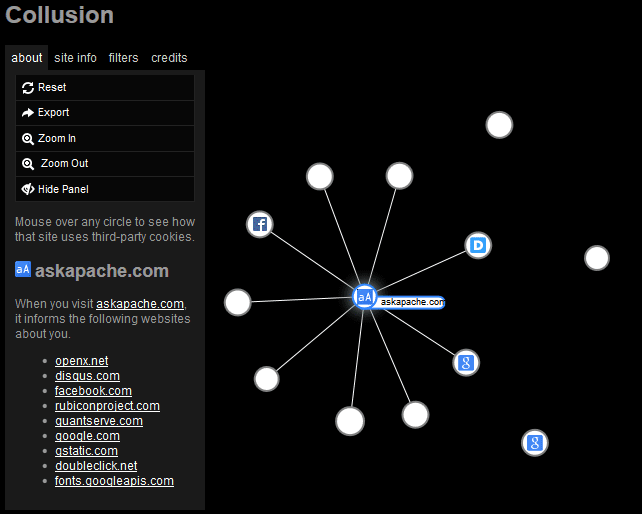 It shows, in real time, how that data creates a spider-web of interaction between companies and other trackers. If you don't see the Collusion icon in the bottom right corner of your browser, make sure the add-on bar is shown. On Windows, click the Firefox menu button, then click Options, then check "Add-on Bar". On Mac, go to the View menu, then the Toolbars menu, then check "Add-on Bar". We're working on adding more features, such as being able to upload an anonymized version of your Collusion data so we can build a big picture view of the tracker ecosystem. We're also working on visualizing other methods of tracking besides third-party cookies and improving the visualizations generally. If you would like to keep an eye on our progress, file a bug, request a feature, or get a copy of the source code, please go to https://github.com/mozilla/collusion or check out our wiki page at https://wiki.mozilla.org/Collusion. Collusion is an experimental add-on for Firefox and allows you to see all the third parties that are tracking your movements across the Web. It will show, in real time, how that data creates a spider-web of interaction between companies and other trackers. We recognize the importance of transparency and our mission is all about empowering users — both with tools and with information. The Ford Foundation is supporting Mozilla to develop the Collusion add-on so it will enable users to not only see who is tracking them across the Web, but also to turn that tracking off when they want to. Your data can be part of the larger story. When we launch the full version of Collusion, it will allow you to opt-in to sharing your anonymous data in a global database of web tracker data. We'll combine all that information and make it available to help researchers, journalists, and others analyze and explain how data is tracked on the web. Not all tracking is bad. Many services rely on user data to provide relevant content and enhance your online experience. But most tracking happens without users' consent and without their knowledge. That's not okay. It should be you who decides when, how and if you want to be tracked. Collusion will be a powerful tool to help you do that.